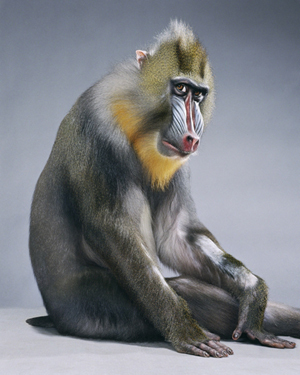 Jill Greenberg is known for her photographs of celebrities, but in this series she focused on actors of a different sort, playfully capturing the similarities between simians and humans. Many of the monkeys and apes she photographed have appeared on film or in television shows. Her intimate portraits of these animals convey a startling range of emotions and personalities.